Computer storage has been stuck in an innovation rut over the last two decades. While consumer drives have improved immensely, the fundamentals they’re based on haven’t changed. Computers use DRAM for random access memory, paired with either a mechanical hard disk or a NAND based solid state drive for long term storage. Intel and Micron have announced an all-new storage technology, 3D XPoint, which finally moves the industry forward. The result of a decade-long partnership, this innovation is up to 1,000 times quicker and 1,000 times more durable than existing NAND flash. It also offers a 10x improvement in density. 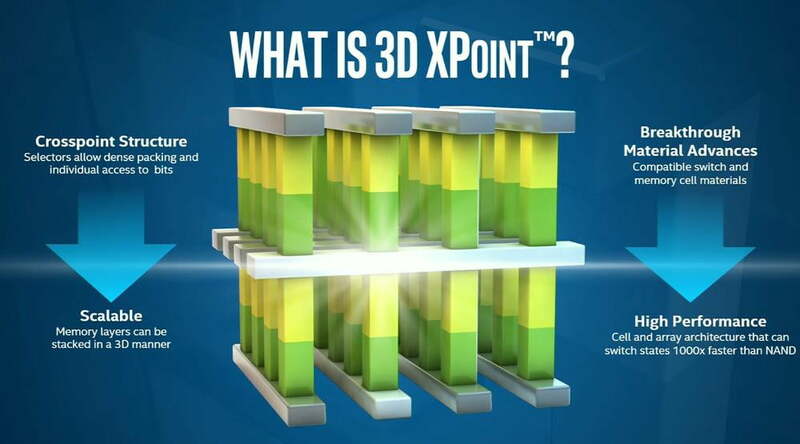 These dramatic numbers are the result of 3D XPoint’s unique design. While the companies have predictably refused to share details of the architecture, both were clear that it’s not a branch of any previously existent technology. Drives built on 3D XPoint will store data using “bulk material property change.” In other words, writing to the drive will fundamentally change the actual material of each memory cell. This is different from NAND, which works by trapping electrons, or mechanical hard disks which store data magnetically. As the name implies, the new architecture can be built in three dimensions. This contributes to its higher data density, and will make the memory usable in a wider variety of applications, but Intel and Micron made it clear that 3D XPoint is in no way related to 3D NAND. “There are fundamentally different principles of physics involved. The cells are different in how they work. It’s up to 1,000 times quicker, and writable in very small amounts, so it can be used as memory. But it’s also non-volatile, so it can be used as storage,” said Rob Crooke, Intel’s Senior Vice President and General Manager of the Non-Volatile Memory Solutions Group. What’s it good for? Everything! What can this new technology be used for? According to the companies building it, nearly everything. 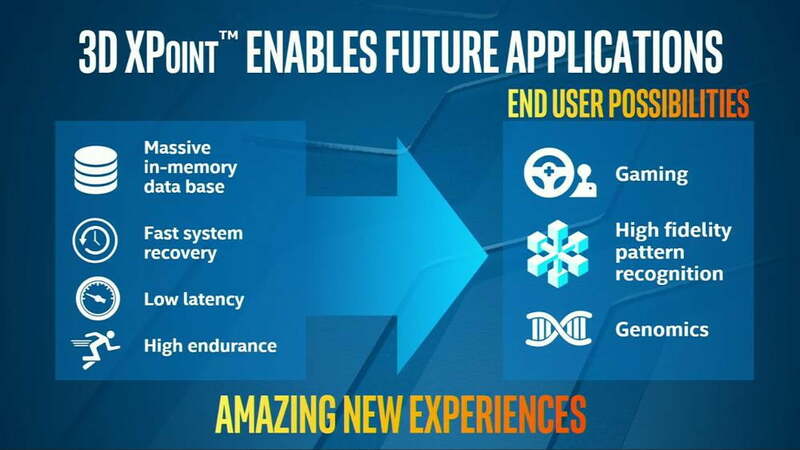 3D XPoint should have the speed necessary to make it viable for use as short-term computer memory, yet it also has the endurance and stability needed to make it useful for long-term memory storage. The implications are immense. Virtually all computers today have to use a small amount of RAM with a larger, long-term storage drive. This separation creates complications for programmers and limits the amount of data that can be made readily accessible at any one time. Mark Durcan, Micron’s CEO, used gaming as an example. He said 3D XPoint will allow for a “much richer gaming experience” because it eliminates the problem of loading new content into a simulation. Drives based on the technology will be large enough to store every asset, yet quick enough to load those assets without any noticeable latency. That’s a big deal even for today’s games. Grand Theft Auto V, for example, struggles to load new textures when a player drives quickly down a street. Connection bandwidth will be an issue for this technology because of its speed. Rob Crooke addressed this point, saying “Moving to Non-Volatile Memory Express over PCI for storage is really important. It eliminates a lot of the bottleneck.” He also stated there will be “other attach points” for the technology, but did not go into specifics of what they might be. While the announcement was made today, production drives will not be on market this year, which is likely why the companies were so vague about the architecture’s details. The current launch window is 2016, and the initial product is expected to be a 128Gb drive. Intel and Micron will be building and selling the product independently under each company’s respective branding. There’s no plan to license this technology out, so unless competitors create their own version of it independently, 3D XPoint will be without peer. In terms of cost, the new technology will fall somewhere between NAND flash and DRAM in terms of cost-per-gigabyte. That’s actually a large range, as NAND tends to be priced just below a dollar per gigabyte, while DRAM hovers around four to five dollars per gigabyte. In other words, it’s likely that the first drives will be very expensive – possibly several times more so than current NAND solid state drives. As a result, Intel says it sees 3D NAND and 3D XPoint co-existing for some time. The former will be useful for quick, bulk storage, while the latter will be used in cutting-edge applications. If all this jargon seems overwhelming, I don’t blame you. It’s a lot to take in. 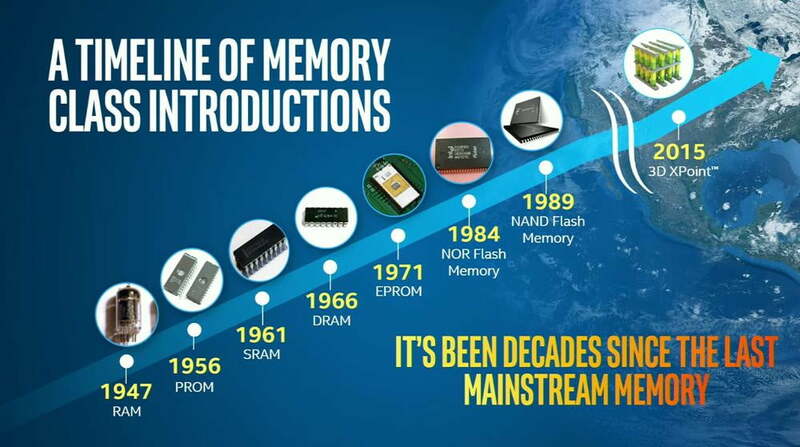 What’s important to know is that 3D XPoint represents an all new memory architecture, the first in two and a half decades. Its inventors claim it’s far quicker than anything available today, yet also far more durable. And because it’s non-volatile, it retains memory even when no current is applied, so 3D XPoint can be used for reliable long-term storage. It seems to do it all, and I’m excited to see the first drives based on it arrive next year.